I love the box the deck comes in. It is of typical Hay House size and style. The feel of it though! It has a matte finish that is as soft as satin. The box itself is sturdy. You can definitely keep your deck in it without worry of it being damaged. The soft, pale, whimsical coloring of the box only teases as to the wonders inside of it! 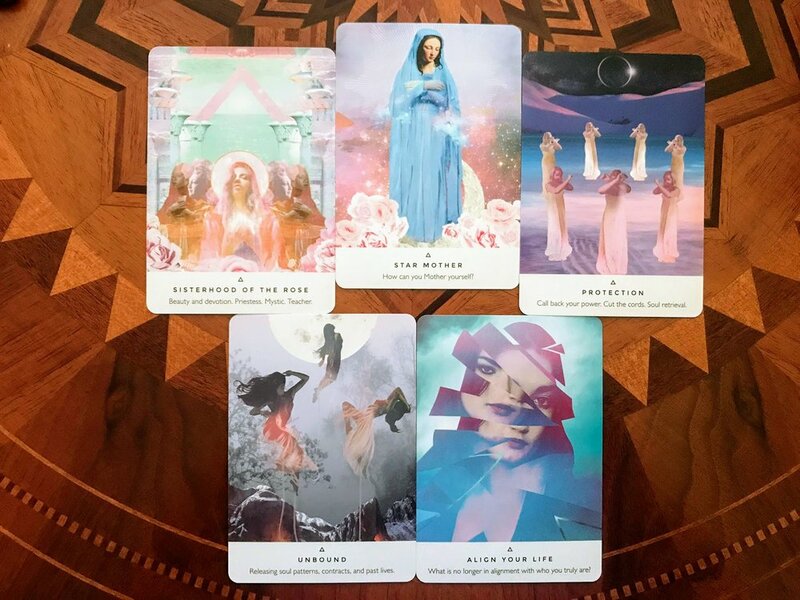 As far as the guidebook goes, it breaks down how to work with the five suits, how to attune your deck, tips on how to open sacred soul space, spreads, and the card meanings. It gives some great information on symbolism, energies, and mythical places that you may be unfamiliar with in the deck. The wording also has a vibe that radiates loving and empowering guidance. The cards themselves feel as lush as the box! If you are familiar with any of Danielle's decks, the feel is very similar to that. Velvety, smooth, and seductive to say the least. As card reading is a very tactile thing, I appreciate a good satin matte finish. The backs are also in keeping with Danielle's trademark style of work. The roses and colors make it feel dreamy! It is soft, feminine, and geometrically striking all at the same time. I appreciate the addition of confirmation cards. There are four in the deck. I find that this can be particularly useful when you're really stumped on something or are looking to give yourself permission or validation. I was quite pleased to see a few women of color included in this deck. Each of these women is gorgeous and powerfully ancient in her own way. I especially love the "Priestess" card. It screams black girl magic! They all do really. You can see it in their stances and facial expressions. Hey Starseed! What is the place you call home? I was excited to see "Lemuria" and "Pleiades" included however, I was even more surprised to see "Mintakan" which is a place I'd never heard of before. Now it's got me curious and hungry for more knowledge about this beautiful land that has been lost to the ages. I can definitely sense Danielle's influence in the creation of these particular cards. There's levels to this - seriously. 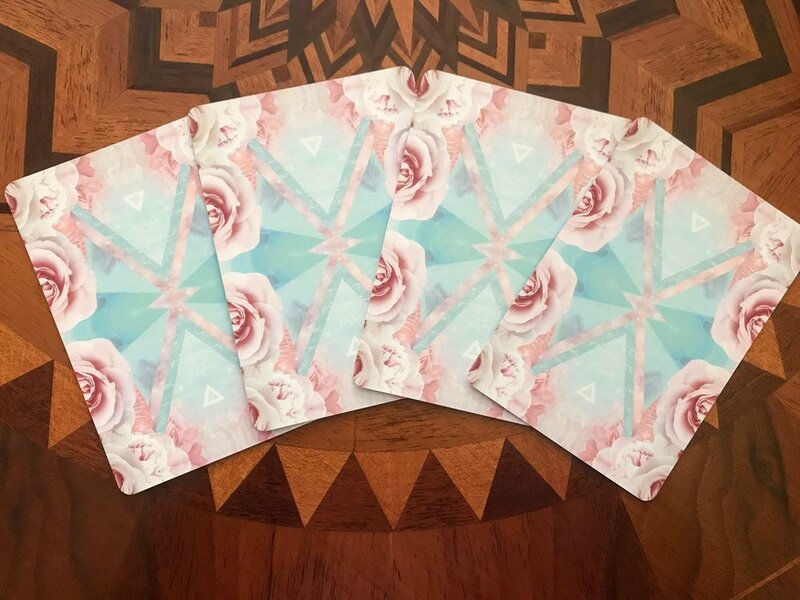 If you're looking for a raise in vibration and connecting to spirit, this group of cards may be of help to get you going! I think these (along with the cards that contain women of color) are my favorite in the whole deck! The concepts of which are very important to and hold deep meaning for me. I love using this Deck Interview Tarot Spread by Beth Maiden of Little Red Tarot. You can read her original blog post here. 1. Tell me about yourself. What is your most important characteristic? Transformation - This deck is about ascension and deep healing on a DNA level of frequency. By connecting to it's high vibrational frequency, it will allow me to change my awareness. If I am looking to create alchemy within and shift my energy, then this is the deck I should work with. 2. What are your strengths as a deck? Fill Up Your Well - When I am feeling drained, tired, and worn, this deck will be an elixir for my soul. It will fill my cup with love. This deck is like a retreat from the world, a drink of fresh water, to refuel the spirit. 3. What are your limits as a deck? Play - This deck is going to give it to me straight. It takes healing and development very seriously and doesn't play around. Which is great for me because neither do I! If I want the truth straight with no chaser, all I have to do is pick a card, any card. This deck is for serious inquiries for healing, growth, and ascension. 4. What are you here to teach me? 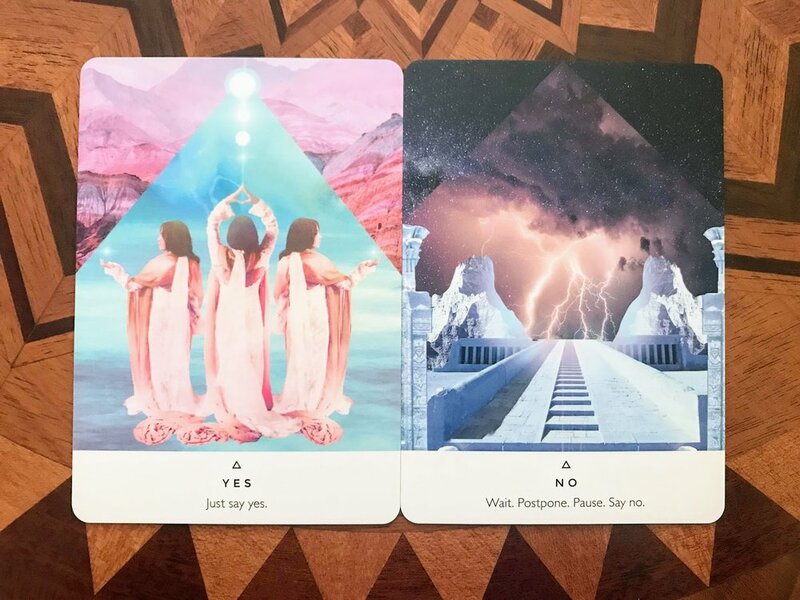 Boundaries - For me personally, I feel like this deck is one that will teach me when and how to say no. It will help me to determine what is in my best interest and where I need to set boundaries for self-preservation. 5. How can I best learn and collaborate with you? 6. What is the potential outcome of our working relationship? Mintakan - Working with this deck will be a welcome back home for me. A reunion of soul. A remembering from the deepest corners of my heart. She says to me, "This is where you belong Lightworker." 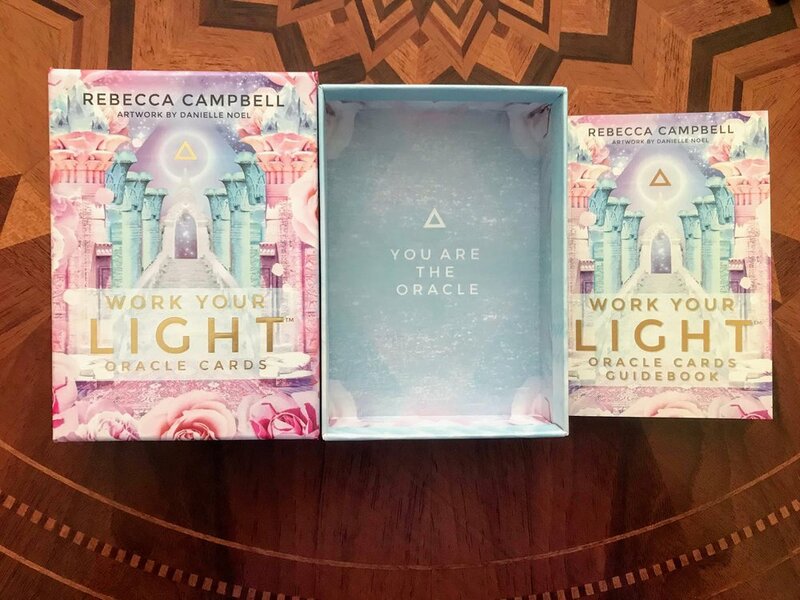 The Work Your Light Oracle by Rebecca Campbell and Danielle Noel is beautiful, soft, graceful, magical, and honors the divine feminine so beautifully. It honors the lightworker and the starseed, the priestess and the initiate. I can't wait to use this in my practice, especially for my monthly Lightworker Evolution Readings over on the Maven Unmasked YouTube Channel. Here is the Spiritsong Tarot! I have found a gorgeous new tarot deck and my fingers are itching to work with it! As some of you know, I am quite picky when it comes to tarot decks so I am over the moon to have found a tarot deck that resonates with me. Spiritsong Tarot was created by Paulina Cassidy and was published by U.S. Game Systems, Inc., in 2017. In this deck interview, I get to know the latest whimsical edition to my collection quite a bit! I also have a link to my unboxing of this deck where you can watch in real time as I unwrap this baby, examine the card stock, explore the guidebook, and drool at the artwork. You can find the video at the end of this blog post. In this deck, the four suits are represented by symbols associated with that suit that can be found in nature. I don't mind the name changes of the suits and find them quite fitting. I also love the fact that the Suit of Feathers isn't all birds or that the Suit of Shells isn't all sea dwellers. There is a wide variety of creatures represented in this deck. The animals depicted on the cards do not necessarily belong to the elemental suit of the card they represent. Are you ready to get to know Spiritsong Tarot? I sure am! Tell me about yourself. What is your most important characteristic? What are your strengths as a deck? What are your limits as a deck? What are you here to teach me? How can I best learn and collaborate with you? What is the potential outcome of our working relationship? This deck is a talker! It likes to work and may be blunt in it's delivery. It's main goal is bringing a plan of focused action to the table. Let's put on our thinking caps! This deck is helpful for determining how to best pull out my inner strength. It can help me to develop a better send of self-confidence - hellloooo solar plexus chakra! It loves to come up with empowering solutions to tough problems. Sometimes even the smallest solution can be a powerful one. It sees the little details I may miss when I'm in panic mode or feeling small. This deck is not for answering questions pertaining to spiritual development and awakening. It is better suited for aspects of the physical realm like relationships, health, abundance, creative endeavors, intellectual pursuits, or decision making. This is not the deck when you're looking for respite or spiritual revival. Spiritsong Tarot wants to get things done! Expect the unexpected. Have a Plan A, B, C, D, E, & F. Know and be respectful of your limitations. Know when someone is incapable of being something that you need. Be your own best support. The best way for me to collaborate with this deck is when trying to see through illusions or any fantastical ideals that I have built up in my head around situations. This deck is a reality check, a dose of intuitive wisdom. It wants me to open my mind, play with my imagination, but still have the awareness for when a shift to a higher perspective is needed. This deck wants to challenge me in every aspect of my growth and who I am. It wants me to take my power back. To roar confidently with a voice so strong that the quiet leaves begin to tremble. I happily accept your challenge Spiritsong Tarot! If you want to see more of the cards, here's my Spiritsong Tarot Unboxing video on YouTube! Do you work with this deck? What have your experiences been with it? Everyday Witch Tarot by Deborah Blake with art by Elisabeth Alba was published by Llewellyn Publications in 2017. Here are my thoughts and first impressions of this deck as well as some of my favorite cards and a deck interview! I love the box the deck comes in. Nice, strong, and sturdy! You can definitely keep your deck in it without worry of it being damaged. The side of the box is magnetized for easy and secure opening and closing. I like the images from the deck they chose for the box and guidebook which are that of the Judgment card and The High Priestess. I am really digging the guidebook! It is in full color with nice glossy pages! It is 252 pages long and includes the authors version of the Celtic Cross tarot spread, card images, cards meanings complete with a section for each card called "Things to Consider," and comes with space for Notes alongside each card interpretation which I thought was a great addition. Great job on the guidebook! The only thing I would have liked to see is perhaps an "Everyday Witch Tarot Spread". Tucked away, safe and sound. I think the back of the deck is pretty cute! You went all out for a banging box and guidebook but went super cheap on the card stock! Why? Ugh...it is pretty flimsy. If you have the Green Witch Tarot, the card stock is pretty similar, but I think Everyday Witch's may be a tad bit more thin. Everyday Witch Tarot however, takes the cake on the box. (My Green Witch Tarot box is pretty much destroyed). I normally don't complain about card stock too much and I love a deck that can give me a good riffle shuffle without having to work it too hard, but this is a bit comical. I feel that these would bend and crease very easily. I'm honestly afraid to give them a rifle shuffle. Considering it is my only gripe with the deck, it is something I am willing to overlook however, next edition - please get better card stock! Temperance - I love how this depiction of Temperance really says to me, "Everything in moderation, whether it be sweets or social media." The Lovers - This image of The Lovers talks to me about how powerful manifesting and ritual can be with both a male and female party. I have only done ceremony with a male friend a few times however, I could feel a different type of power behind it! There is much magic in joining the divine masculine and the divine feminine in your workings. The High Priestess - Tarot cards, runes, books, and a crystal ball. Need I say more? Three of Swords - Dear Diary. Your first break up or realizing your crush is not that into you. This card really takes me there. Six of Pentacles - This Six of Pentacles for me is about knowing what each person needs. Everyone is different. Tune in to that energy. The Devil - Temptation is sweet, but do you know what you're really in for? This image of The Devil almost reminds me of Hanzel and Gretel or The Little Mermaid when she sacrifices her voice to Ursula in exchange for legs. King of Wands - I love how this makes me think of the King of Wands a bit differently. A strategist, a planner, a military commander - a worldly man with a plan! Nine of Swords - This Nine of Swords takes me back to studying for a big final exam and feeling overwhelmed. Like reading the text but not fully comprehending or absorbing what you're reading. The Fool - It is a young, fresh, and fun deck. Its definitely not afraid to go out on a limb and take a leap of faith! The Lovers - I think it would be a good deck to use in magical workings and love readings. It also joins the divine masculine and the divine feminine in a beautifully balanced way. Knight of Cups - It tends to be pretty optimistic and follows its heart. Focusing on love, feeling, emotion, and flying high - not necessarily unforeseen risk or danger. The Hermit - How to be meditative, rely on myself, and listen to my inner wisdom. Two of Swords - This really feels like having blind faith and trust. Tune out the world and come within and to Spirit for direction, guidance, or instruction. Ace of Cups - A new relationship (perhaps of even a spiritual nature) that is overflowing with love and creative energy! 7. I also pulled an additional card for this interview with no set position or question attached to it. The card I received was the Six of Cups. Childhood memories and nostalgia. This deck definitely takes me to that place. Maybe that is why I like it so much! Here are my final thoughts. All in all, I really like Everyday Witch Tarot. I think it's a good deck for someone new to tarot, of a younger age, or is very in touch with their inner child. I also think it may pack a powerful punch when you least expect it. I used it after spending time at my altar and it was pretty spot on! It will also hammer away at a message it needs to get across. It's a fun, sweet, and colorful deck that is very much in the RWS (Rider-Waite Smith) style that comes with a great box and guidebook. If the flimsy card stock isn't too much of an issue for you, I would give it a try! The Gaian Tarot has had my eye for almost a year now and for good reason. She is a breath of fresh air! I especially love how the artist included people of all colors, shapes, ages, and sizes in this deck, as well as the elements of nature and the beautiful creatures of our planet. The images are stunning and it feels like a 'welcome home old friend' kind of deck. Relaxed, inspired, down to earth, comforting, and loving - just as any deck with 'Gaia' in the name should be! I decided immediately upon her unboxing, that it was important to do a deck interview with her, and right away too. I don't always get this feeling from decks, however I knew our relationship would be different. She had something very important to share with me. The questions in this deck interview tarot spread were either created by TABI (Tarot Association of the British Isles) or someone on Aeclectic Tarot, I'm not sure which. I however, found this spread through the lovely tarotista Beth Maiden of Little Red Tarot. Elder of Earth - She is the ultimate provider. Crafty and kind. Resourceful and knowledgeable. Fruitful, abundant, and well loved. Seasoned and wise. Understanding and sympathetic. Responsible. She is connected to all of time, to the weaving of fate, for there is no beginning and no end to her wisdom. Elder of Air - She is a fantastic communicator! Her words a melodious symphony. Her voice is like the whisper of the wind and clear as a bell. She communicates in such a grounded and reachable way, so that all who encounter her can comprehend her message. A language of divine wisdom, that we as humans, creatures who live on this planet, inherently understand. When you hear what she has to stay, you will stop and listen. The Moon - This deck is not what you would call intuitive. She is earthy. Her concepts are very tangible and real. She will not give you all of the answers as she realizes the importance of facing the fear of the unknown. The importance of being present in the moment and living your journey. Part of the wisdom she shares is the paramount power contained in the learning of lessons. Explorer of Fire - Dare and do. All I need to do is to pick her up and give her a shuffle. She is ready, waiting, and willing to help! She invites me to have confidence and to act on the knowledge she gives me - especially seeing as she has been around a time or two and knows the ropes (remember the Elder of Earth). She does not give empty guidance. Don't ask if I am not willing to listen. Create with her and do not be afraid to share the results! The Seeker - Discovery. Adventure. Wonderment and freedom. Play and new beginnings. The excavation of the truth of my soul. She will bring a refreshed and soul nurturing energy to my readings. We can create anything we wish together. The story has yet to be written, but she is excited for the journey of our spiritual quest together. As I'm writing this, having completed this interview, the lyrics of Natasha Beddingfield's song "Unwritten" comes to mind: "Feel the rain on your skin. No one else can feel it for you. Only you can let it in. No one else, no one else, can speak the words on your lips...Today is where your book begins. The rest is still unwritten." If you'd like to learn more about the creator behind this work of art, please check out the author's website here. Do you have this gem of a deck? If so, what are your thoughts? What has the Gaian Tarot taught you thus far in your journey together?